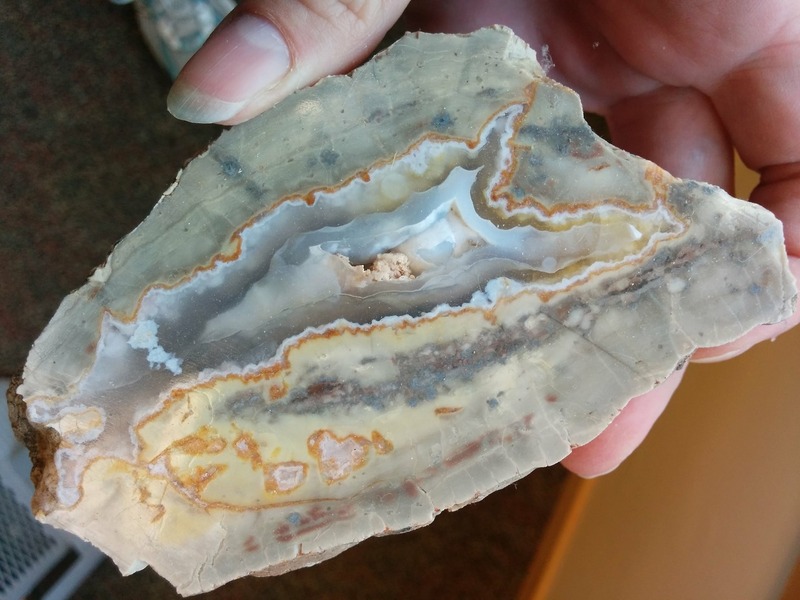 Hey all, finally got permission from my boss to sell some of my material sourced from his land, with all profits are going back to a scholarship fund I help manage. 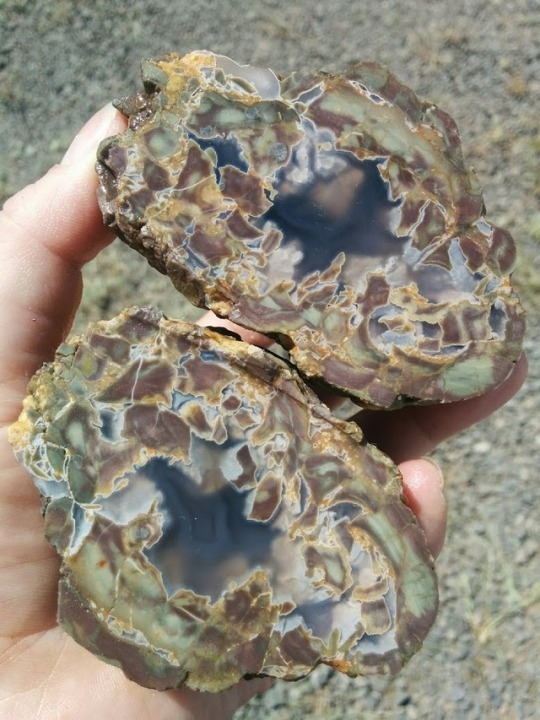 A lot of folks have asked about the "Old Military Road" thunder eggs, so that's what I would be selling. 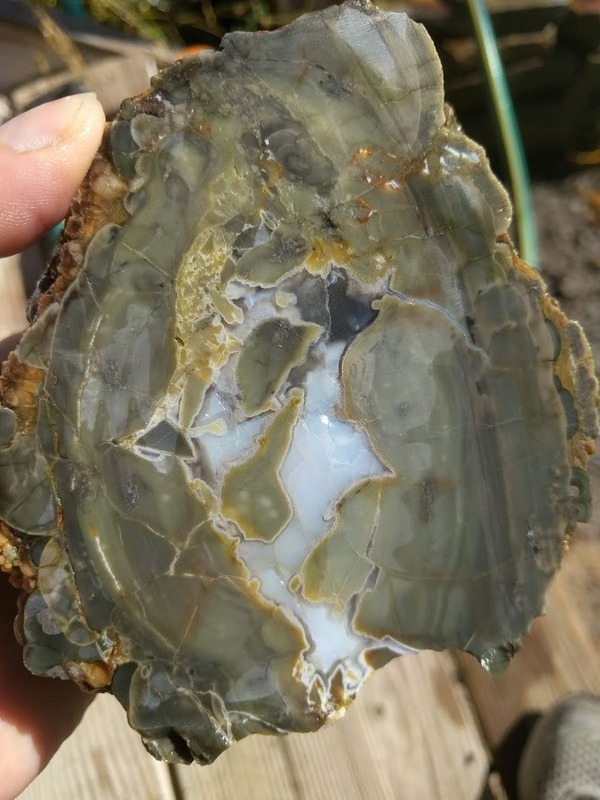 I have never sold lapidary material online before and honestly believed I'd never get permission to sell these eggs :P despite asking like a broken record for the past three years! I would appreciate advice. This is a unique location, so I assume I'd be marketing to location collectors, not as much to cabbers and jewelry-makers. Most eggs are surface collected and have a crack or two, and while I have good examples of cut eggs, I don't have any polished. 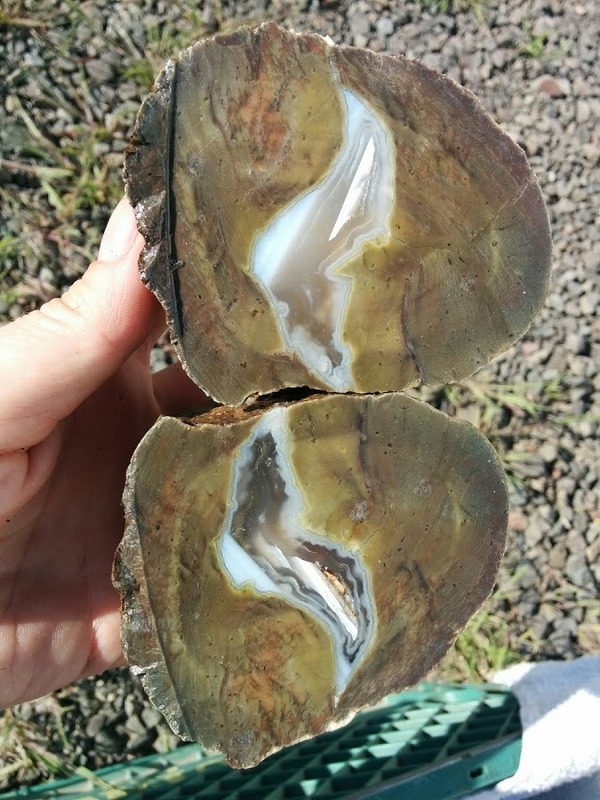 When you look for thunder egg lots, what do you like to see? Consistent size or variety of sizes? 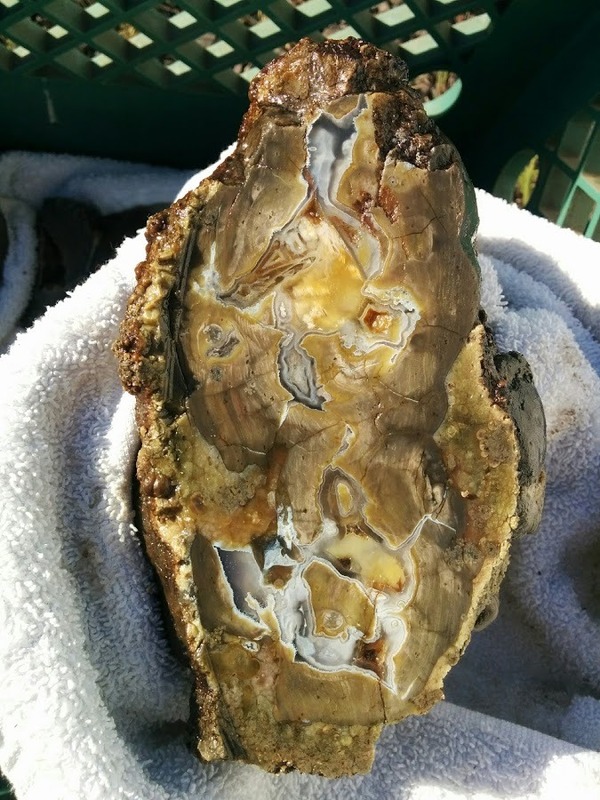 All uncut or one or two cut plus uncut from the same location? Just cut, so you know what you're getting? Minimum size versus maximum size? I realize not everyone's going to have a saw that can handle a big egg, while small eggs aren't always filled. I would value opinions, anecdotes and experiences from the online sales world. In the mean time off to resurrect a very ancient ebay account. Uncut would be very inexpensive as these eggs have been out of the trade a long while.Do you have pictures. 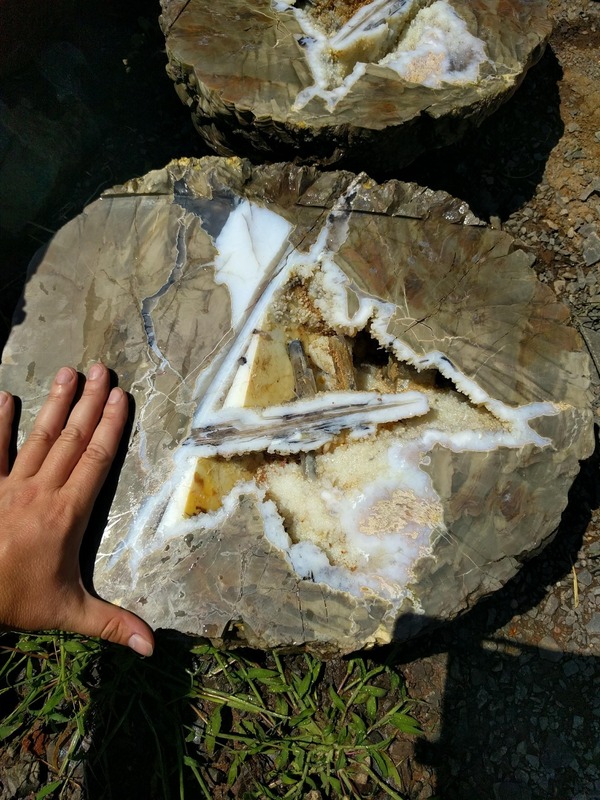 If they are prime I would simply sell some here and then deal with a dealer like Terry Maple who sells special rough from the west as well as other rough. The uniqueness would be crucial I would think. I have sold T-eggs on line and at shows for a number of years. Sold over 2 tons that I mined as well as some resale eggs. I look at the market for similar types of eggs for price setting. Unique eggs can command more if you are only selling a small amount as a rule. I would look at prices from Richardson's as they have similar eggs and a good variety. Also shops such as The Gem Shop Inc as they are quite nice to deal with. Of course there is Tim's on-line store which has great variety but I have found a lot of his prices a bit steep. And if you look at e-bay check the SOLD listings in the search function, not the this is what I want for my RARE T-egg in the auction listing. On whole eggs it is a crap shoot for the buyer but a real win - win for the seller as opposed to selling the T-eggs cut. But you need to be honest on the odds of getting a good egg verses a dud and show samples of what the buyer should expect. Too many sellers out there who oversell the story and lead to great expectations on rough. Leads to bad feelings, and I would be happy to share names only in private convos..... ie "no cracks or tiny fractures", etc..... Put me on the interested list, never have too many eggs. 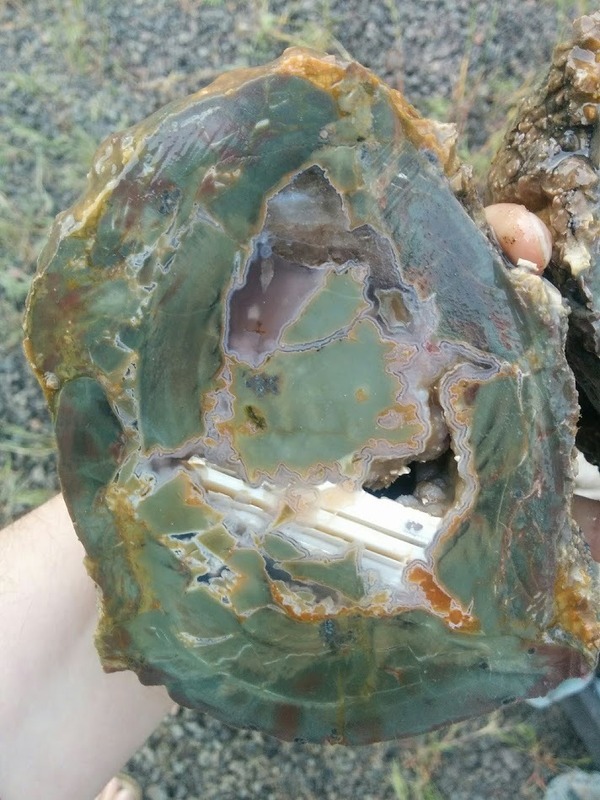 You might also try the thunderegg forums on Facebook. Many t-egg collectors hang out there from all over the planet, and would be interested in buying eggs from an old site such as yours. Good prices paid there. Check into shipping options for northern Europe and Japan, where many of the big fanatics live, and think about selling in lots that fit into a flat rate box. Get in some of the post office's free boxes in appropriate size by visiting their web site before you start to sell. Makes it much easier to divvy up the eggs among boxes, then offer them for sale as small lots of eggs (whatever fits into a particular box). For overseas, there is the (Large Video 1096L box) that is roomier than the standard Small Flat Rate, yet ships overseas at the same price as Small Flat Rate (would work best for small lots of eggs under 2"). For bigger eggs and larger lots, the Medium Flat Rate box is probably what you'll want to have on hand. Thanks for the advice everyone! I appreciate your replies. 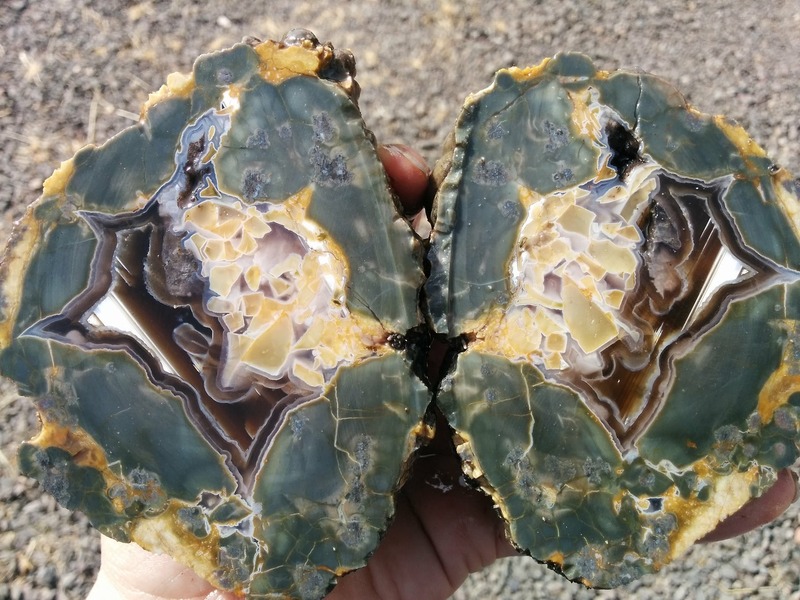 For now I will stick to cut thunder egg pairs, unpolished and clean, so people can see exactly what they're getting. Everything is surface material so cracks exist, but the material tends to be visually striking and unique. Will be cutting, sorting and see what I can offer over the winter. Maybe one out of every six or eight from this bed is a dud. This is an example post, not a sales post. That top one is drool worthy... I love number 4 also. Nice finds! I agree - your "best" one is fabulous. The others are nothing to sneeze at, either (wherever did that phrase start?). Nice, 1, 4 and 5 for me and the rest too. Thanks for the pics. #1 is amazing, and that #2 is a wowser when you have the hand there for size reference! I really love the green in #3 also. I'm jealous that you have access to such nice eggs on a regular basis. I like big eggs, interested in your #2 when you do stand up the process to sell. Ok got a few up. I am still very open to advice :P so if you see something that doesn't look right please let me know! Been a few years since I last used ebay.